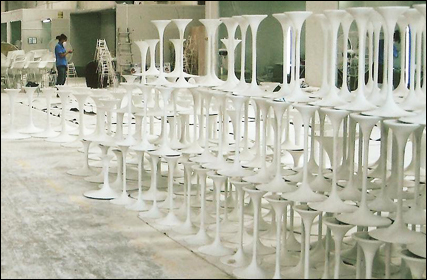 We drew our inspiration for the Trumpet® table from mother nature herself. 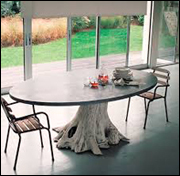 All tables need a strong, wide base to support a sturdy trunk, which supports a flat useable surface. 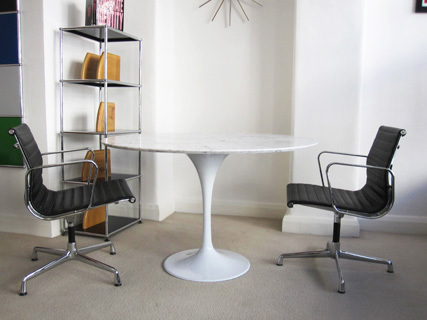 Our oval Trumpet® tables (pictured below) are available in three sizes as standard, 200cm x 120cm, 180cm x 100cm, and 160cm x 80cm. 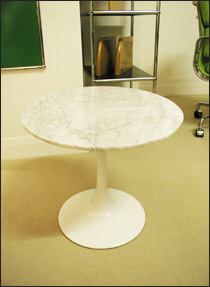 The tops are available in marble or granite. 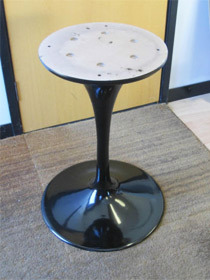 These come with a 74cm high base in black or white aluminium. 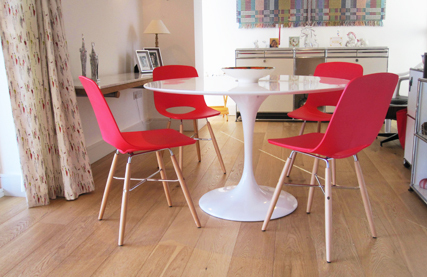 Our circular Trumpet® dining tables (pictured below) are available in two sizes: 120cm diameter, and 90cm diameter. 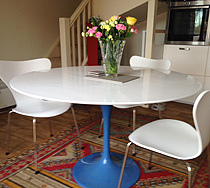 These come with a 74cm high aluminium base in white, or black. 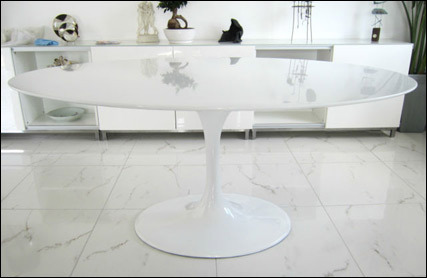 Standard top finishes include fibreglass, marble, or granite. 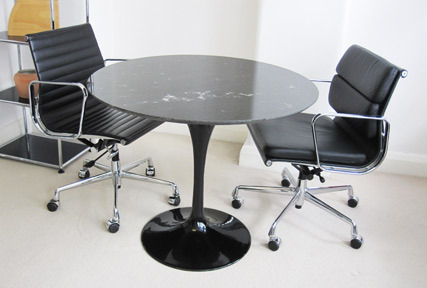 The Trumpet® table and chair designs that we offer feature a single central leg supported by a circular base. 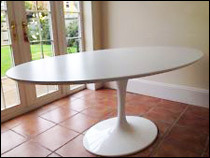 The 120cm Trumpet® table, pictured above, comfortably seats six people, whereas the 90cm Trumpet® table, pictured below, seats four people. 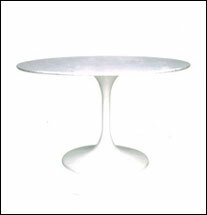 Our circular Trumpet® coffee table is 50cm diameter and comes as standard with a 46cm fibreglass base in white, or black. 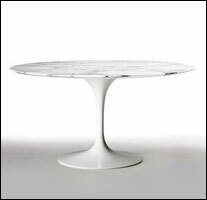 Trumpet® coffee table tops are available in white or black fibreglass, white marble, or black granite. 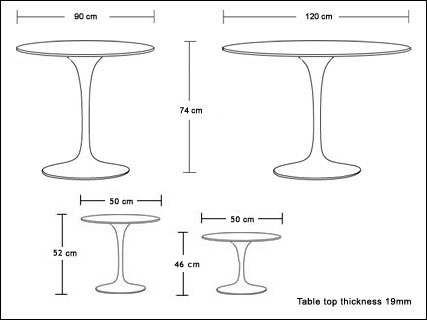 To complement the Trumpet® Table range, a coffee table is available in white or black, with fibreglass tops, measuring 50cm diameter and 45cm high. Our price includes delivery within mainland UK and our lifetime guarantee. 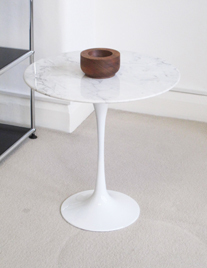 To complement the Trumpet® table range, a coffee table is available with a white carrara marble top, measuring 50cm diameter and 45cm high. 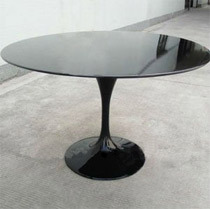 To complement the Trumpet® table range, a coffee table is available with a black granite top, measuring 50cm diameter and 45cm high. 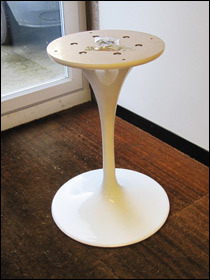 We are pleased to offer a selection of Trumpet® table bases without tops, so that you can customise the table to your own requirements. 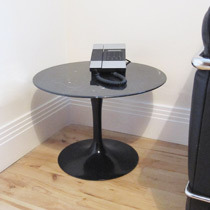 Bases are available in black or white aluminium as standard, or in other painted colours as special order. Our prices include delivery within mainland UK and our lifetime guarantee. 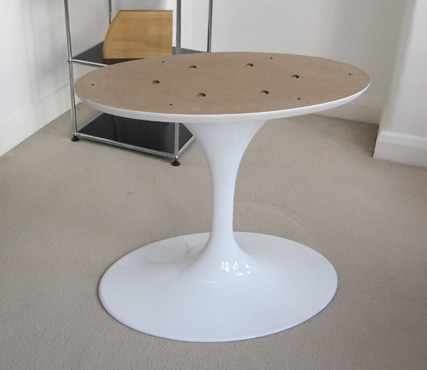 Our Trumpet® tables can also be produced using real wood veneer tops on aluminium bases. These wood veneers are a special factory order. 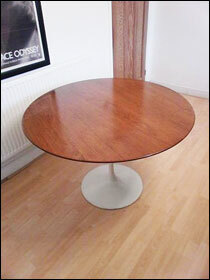 Our special wood veneer finishes include oak, beech, cherry, ash and walnut. As these are made in our own factory here in the UK, we have the flexibility to produce any size top or material to your specifications. 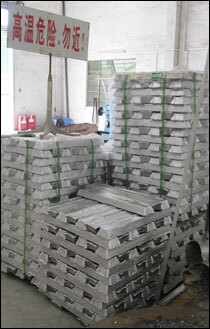 Customers are advised that unlike granite, which is a very hard material, marble is soft and porous. 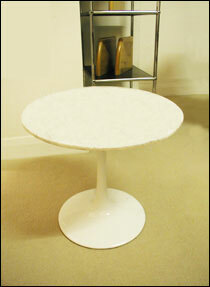 As a result, in extreme cases, stains can occur if hot or cold items are placed directly onto the table. 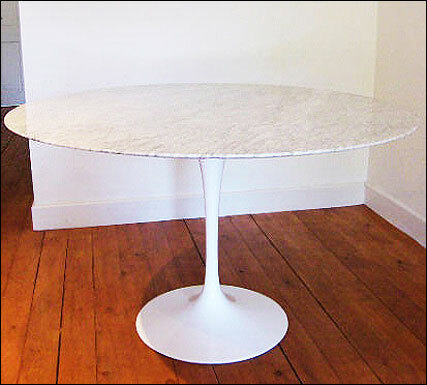 We therefore recommend that if you have purchased a marble topped table, that you always use place mats and coasters. In order to bring the Trumpet® table to a far wider audience, one of the questions that keeps cropping up is can we produce the bases in more interesting, lively, vivid colours? 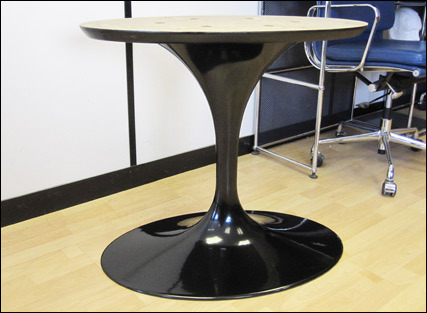 Here at Scott Howard, we want to address this challenge and our aluminium Trumpet® table bases are now available in any RAL paint code at an extra on-charge. Please contact us on 0207 724 1130 for a quotation. 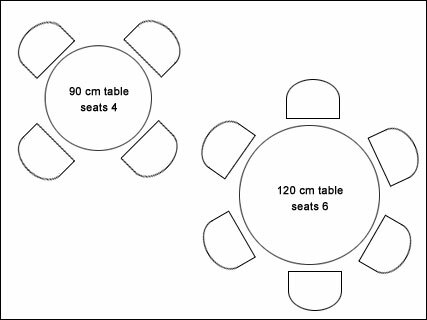 Here, we show a small selection of tables using the more whacky colours to get people thinking about the possibilities available. 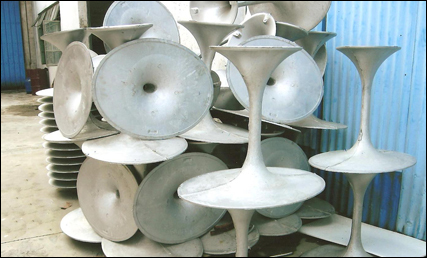 Here at Scott Howard, we offer two types of Trumpet table bases: fibreglass and aluminium. 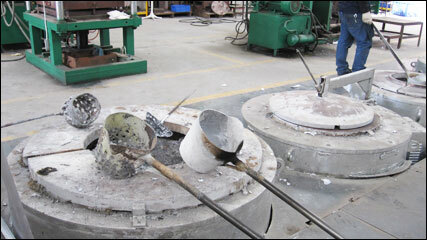 To demonstrate that the bases are true aluminium, here we show aluminium ingots being turned into Trumpet® table bases at our smelting plant in the factory. 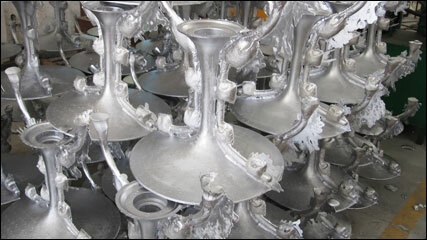 The term Trumpet is a trademark of Scott Howard Office Furniture Ltd.